Disclosure - Summit SOP is a Bowsite.com Platinum sponsor. We assure you that we evaluated all products fairly and objectively based on the criteria above. 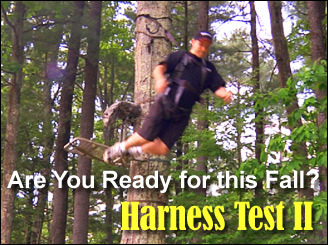 How we conducted each test - we used criteria forms to evaluate each harness and all product was left in its original packaging until the actual test took place on June 14, 2009. We skimmed the instructions (which is what we believe most people would do) and we put each vest on to gauge how intuitive the harness is for the hunter to figure out. After the evaluations in Part 1 we performed a controlled descent off of a ladder to give us a risk-free hang test. We are particular sensitive to simply jumping from the tree like we did in our last evaluation. If I was comfortable with the controlled descent in Part II, then I would go ahead and do an actual fall in Part III. Three out of four vests made the cut. We filmed every controlled descent and every fall test just one time using both a fixed camera on the ground as well as a small Point of View (POV) cam which was strapped to each vest to film the experience from my angle. Those videos are included in this feature. Please Read - These tests are subjective and based on my own experience using these products. Your experience could vary based on the features important to you, your body type and weight, how you configured the vest and many other factors. I would like to make this clear that you are reading my opinion based on what I experienced. Do not try this test at home! Serious injury or death could occur if you deliberately attempt to fall from a treestand. It is our opinion that any vest (even the ones that did not test well) are far better than no vest at all. Always wear your safety harness as soon as your feet leave the ground.